Taking place in the vibrant fantasy world of Elor, Aron’s Adventure sees you taking control of the titular character as he battles an ancient evil that’s spreading across the land. The game features a fun mixture of combat, exploration, platforming, loot collecting and Uncharted style rock climbing, all wrapped up in a stylish low poly aesthetic. The current build of Aron’s Adventure features around an hour’s worth of gameplay and it sees you storming a castle as you attempt to save a group of soldiers who are trapped there. It’s quite a fast paced adventure, with a nice variety of enemies to battle, some NPC’s to chat to (with branching dialogue trees), beautiful low poly scenery and two boss fights. The combat isn’t as deep as the likes of Dark Souls, but it’s fast, fun and challenging. 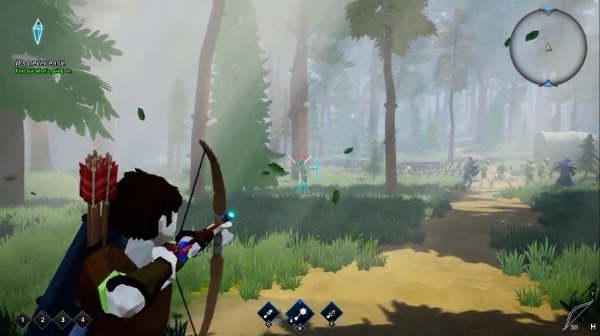 You can use a bow for ranged attacks and a sword and shield for melee attacks, with each one having unique special abilities that can do some serious damage to the enemy. You can only take a few hits though so you need to be careful, using dodges and blocks to evade attacks. Even in these early stages of development Aron’s Adventure is a very promising action RPG adventure. The combat is fun, the enemies are challenging and the game world is an interesting place to explore. It feels a little like a more fast paced and arcadey version of Dark Souls (though nowhere near as punishing). Well worth checking out for some easily accessible action RPG adventuring.